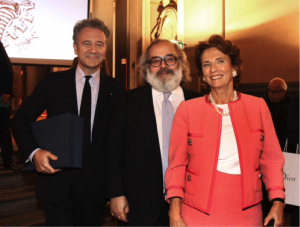 As President of the Amici degli Uffizi, first of all I would like to thank everyone for the prestigious Prize awarded to our association. 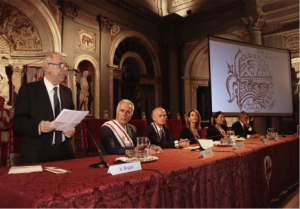 It is an honor for me to receive it and share it with all the members of our Association, established in 1993 to safeguard, enhance and increase the unique cultural heritage of the Uffizi Gallery. The Columbus Prize represents a precious recognition of our activities side by side with the museum as modern patrons committed to supporting the Gallery. That is why we can consider ourselves “builders of civilization” like the famed Genoese navigator. It is a commitment we have been renewing for over 20 years with loyalty and communal intentions in the name of beauty, to preserve and enhance the Gallery’s collection, increase cultural events and exhibitions and encourage donations and bequests. I am so proud and honored to receive this award which I dedicate not only to all our Amici and Friends but to the entire town, with the hope that the olden spirit of discovery, of building and spreading beauty and civilization, will never fail.